Are you thinking about visiting your local dog park? You’ve probably heard some dog owners rave about how wonderful dog parks are for exercising and socializing dogs and how they go on a regular basis and enjoy hanging out with their doggie and human friends. You’ve probably also heard other dog owners describe how these parks are full of diseases and dangerous dogs and that you should never take your dog to a dog park. So, which is it? Are dog parks good or bad? The truth is, not all dogs benefit from dog parks, but start by asking yourself the question below. Why Do You Want to Visit a Dog Park? If you have a confident, well-balanced dog that enjoys playing and interacting with different types of dogs and you’re looking for a way to exercise and further socialize your dog, a dog park might be a great place to hang out. 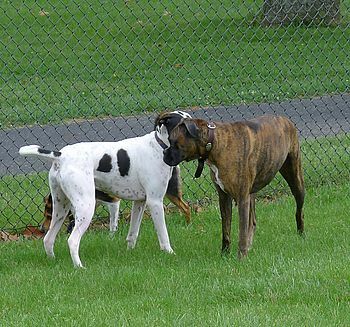 If your dog doesn’t get along well with other dogs or is fearful and you think socializing with other dogs might be one way to help improve their behavior, the dog park is probably one of the worst places to hang out with your dog, at least for now. Dogs that have issues with aggression, fear, dominance, bullying or resource guarding should have their behaviors addressed and resolved in a slow, methodical and controlled process. A chaotic, crowded dog park could end up escalating any problem behaviors you’re trying to resolve. Make sure you have a good level of control over your dog, both at home and while walking outside before visiting a dog park. If your dog is excitedly panting while dragging you to the gate of the park, either exercise your dog beforehand or consider working a little more on training and control first. Next, check out these five good and bad things about dog parks. Most dogs are going to get a lot of exercise while they run and play with the other dogs at the park. Count on being able to relax when you get home while your dog takes a good long nap. Your dog can learn a lot from other well-adjusted dogs while playing at the dog park. Dogs often have very subtle ways of teaching each other good manners through body language or even a low growl. Your dog can also learn to become comfortable around a wide range of dogs with different play styles. You’ll probably meet some very nice people that care as much as you do about dogs. You can learn from them and share your own dog tips. Just remember to keep a watchful eye on your dog while at the park. Other dog owners who care about their dogs will understand if you suddenly walk away mid-conversation to attend to your dog. More communities are building dog parks and if you have one close to where you live, they can be a convenient way to exercise your dog, especially if you’re unable to go for long walks and have a high-energy dog. Most dog parks are free and open to the public. Some offer amenities such as shade, water, dog waste disposal supplies and benches. Some even have ponds and agility equipment and you’ll almost always find some community tennis balls there as well. Dogs can contract diseases and parasites from dog parks, which makes it especially important to keep young puppies away from parks until they’re fully vaccinated. Like being the new kid at school, it can be stressful for a new dog to meet and fit in with a pack of regulars at the dog park. It can also be stressful for an individual dog at the park to suddenly be greeted by a new incoming family with a pack of dogs. Unfortunately, not all dogs at the park are going to be well-balanced dogs. Dog behaviors such as aggressiveness, mounting, resource guarding, body slamming/rolling, ganging up with other dogs to chase or pin one dog and excessively rough play happen often at many dog parks and can escalate into fights between dogs. Although dog owners should intervene and stop these behaviors, many feel it’s best to let the dogs sort it out themselves. This includes owners that can’t or won’t control their dogs, owners that bring in female dogs that are in heat (unneutered male dogs can sometimes be an issue too), owners that fail to pay attention to their dogs while socializing with other dog owners or playing on their cell phones, and (saving the worst for last) owners that drop off their dogs then leave the park to run errands. Young children or kids that chase or grab dogs can be a recipe for disaster in a dog park. Groups of running and romping dogs (some with high prey drives) can easily knock over or hurt a young child. Even the best trained dog may get overwhelmed with a chaotic mix of multiple excited dogs and squealing children. For their own safety, only kids that are old enough to understand how to properly protect themselves and relate to dogs should be brought inside a dog park. Although I’ve had some good times with Haley at dog parks, I’ve also had some negative experiences and I find that the lack of control I have at the parks is what bothers me. Even if I have good control over my dog, I have virtually no control over the other dog owners and their dogs (and children) that may arrive at the park. Maybe if I went to the same dog park on a regular schedule with the same group of dogs (or joined a private dog park) it would be a more positive experience, but I like to do a variety of activities with Haley and I’m not one to stick to that kind of schedule. Don’t get me wrong, I’ve met a lot of really nice people and their pups at dog parks. I just feel that it’s my job to protect my dog and sometimes it’s a challenge to do that at dog parks. I also find that many dog owners are confused about whether to intervene when playing gets more intense or whether to just let the dogs “work it out”. So, my next post will include some general tips for visiting dog parks, advice about when to intervene and what to do if your dog gets into a fight. Don’t feel bad if your dog doesn’t enjoy visiting dog parks or if you’ve had a few bad experiences there. Not all dogs like the parks or even enjoy interacting with other dogs, for that matter. It doesn’t mean there’s anything wrong with your dog or you’re failing as a dog owner. Although Haley has come a long way in overcoming her fear issues and has gained a lot of confidence, she still gets a little overwhelmed in crowded dog parks. She would rather have a doggie play date or a get-together with friends or family members and their dogs in a more relaxed setting. But that’s just my verdict. What’s your verdict? 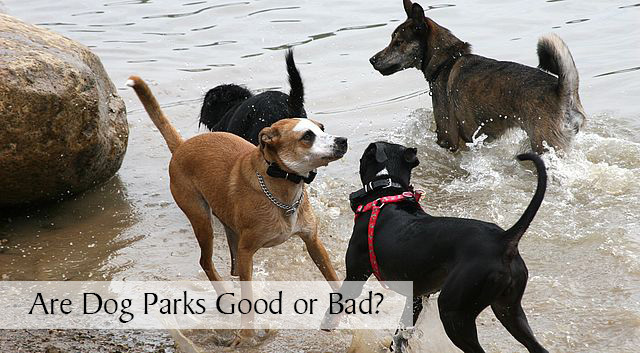 Do you think dog parks are good or bad for your dog? Interesting post. You made very valid points. I do take my huskies to the dog park, but i’m not sure if I would take them to a brand new one where I they are not used to. Dog knows what kind of people or dogs would be there, and I don’t know that I would risk it. It seems like people who go on a regular basis to the same park have the best experience, which makes sense. I’m glad all your Sibes enjoy their dog park. Very nice post ~ we used to take our pups to a few different dog parks in Northern Virginia when they were younger, but stopped going when we noticed that many dog owners are not in control of their dogs & will indeed focus on their cell phones and coffee drinking instead of paying attention to their pups. Yes, young kids scare me the most. I’m so afraid they might get hurt or bitten, especially if their parents aren’t keeping a close eye on them. We don’t frequent them too often because too many owners are irresponsible. I like the idea of a dog park, but haven’t had the best experiences there either. I might look into a privately run park where they screen for temperament and there’s more accountability. One winter we took the dogs to the dog park for exercise. For me there are too many owners with varying opinions on proper dog training/etiquette. Then there were the ones that brought toddlers and puppies and it was too much. Sampson liked hanging with people getting pets and Delilah ran off and did her own thing, so we stopped going. I think there are good parks and bad and if you are mindful, they can be a great thing. You’re right, they are good and bad, depending on a lot of factors it seems. Sampson sounds like Haley, she pretty much wants to hang out and play with people. I was never a fan of the fenced-in, small dog parks when I lived in North Dakota. These were just kind of boring to me, even though it was fun to see different dogs. And people seemed to use them as their dogs’ only form of exercise, so there we a lot of crazy, rude dogs around. But now that we’re in San Diego, we have this awesome dog beach a mile away. It has all the positive and negatives that you mentioned, but for me the benefits outweigh the risks. I know there is always a chance my dog could get hurt or sick, but because he is so easygoing, I don’t have to worry about too much. That being said, we go to the beach maybe 2-3 times per month for a fun outing. It’s not our typical exercise outlet. And no matter what, I can’t always control my dog 100 percent. Just last month, he decided to hump this poor, scared dog like crazy (he never does this!). I had to go physically move my dog away from the other dog. So embarrassing! Lol, Ace got a little carried away at the beach this time. You’re so lucky to live in a such beautiful area with a dog beach close to home, I’m jealous! I’ve always wanted to just go and hang out at the dog park without Haley to observe the body language and behavior of the dogs there, but I didn’t want to look like a dog creeper if somebody asked which dog was mine, haha. I take Mr. N to the huge off-leash area (over a thousand acres). But we don’t go to the small, fenced ones unless they’re empty or just about. He’s too small. How nice to have such a large off-leash area close to where you live. Having all that space would make a huge difference in the dog park experience. I bet Mr. N loves going there! Such a good discussion. 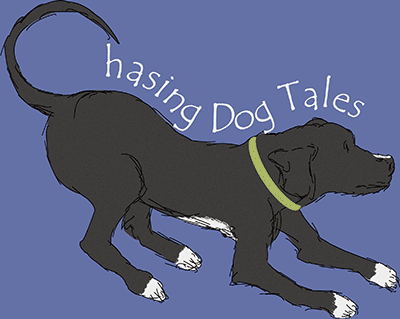 We used to frequent a dog park, but having no control over the other dogs – and, most especially, their owners – soured it for us. We found a highly-supervised, well-controlled doggy daycare, and Lucas and Cooper go one day a week. It definitely costs more than going to a dog park, but it’s a safe, predictable, managed environment. The dogs are grouped by energy level and play style, rather than just by size. They get to blow off steam and play like crazy without the dog park negatives! Hi Maggie, That’s great that you’ve found a good alternative for Lucas and Cooper. I’ve often thought doggie daycare would be a better option than dog parks, but I haven’t tried that yet with Haley. Thanks for sharing your experience. That’s so interesting how the two puppies like going and the other two don’t care for dog parks. Zoey sounds a lot like Haley, she usually wants to hang around me instead of mingling or playing with other dogs. Thanks for sharing your experience about the parks, it further demonstrates how every dog is different. By the way – this post is on point about the good and bad of dog parks. I won’t go in if I see small children. This was great information! I don’t go to dog parks as I live in the country and the dogs can run around on my property. I have a lot of clients at work (vet clinic) that go to dog park but they go to the same one each week and sometimes stuff does happen. Thanks for stopping by and weighing in on the dog park topic! I definitely think going to the same park and maybe even going on the same day/time with known dog friends makes a huge difference on how much a dog might enjoy the park. Dog parks do not check for Vet, papers proving good health. Some dogs might have shot tags on but could be for 3 years ago…Since there is no way to check on other dogs health, I choose not to take my dogs to dog parks. I had that concern too, especially when Haley was a puppy and before she had all her vaccinations. I’m thinking it’s probably even more important to think about the health risks now because people are starting to question the amount and frequency of vaccinations for their dogs. My favorite option is to arrange playdates with family members and friends with dogs. I have had a Vet tell me that a dog park is the worst place you could take your dpg. That makes me feel about Haley not being a fan of dog parks. Maybe she was trying to tell me something when we used to visit them, haha!